What I don't quite know is how to present it. Should devices without multitouch receive a property in their device setup @pazos @NiLuJe @poire-z ? These events have technically always been present on readers like my H2O where they simply never fired. 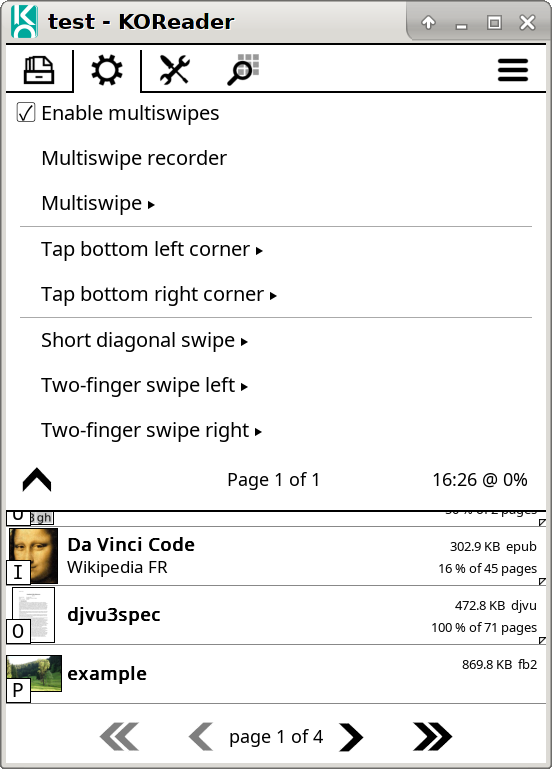 Taking long diagonal swipe and two-finger diagonal tap out of the screenshot module isn't currently an (easy) option, however, because it needs to operate in all circumstances. Should devices without multitouch receive a property in their device setup ? There are also two fingers pinch & spread in readerfont.lua (I disable these ones in my own patch, because it is/was just too easy to trigger them by accident - and you have to wait for a re-rendering on a font you didn't want - and a few other re-renderings when you try to get your initial font size back). PS This stuff about hasMultitouch() is basically a big shot in the dark. I defaulted to hasMultitouch = no because isTouchDevice = no by default, which also seems a little odd now that you mention it. Perhaps that technically predates KOReader. There are a few caveats that I'm not quite sure what to do with. People can hack their older Kobo's to gain multitouch because the hardware supports it, just not the kernel. Presumably my H2O as well, though that shouldn't work with the kernel from this link https://www.mobileread.com/forums/showthread.php?t=232431 Perhaps okreader supports it too? Not that any existing functionality will break, of course. Follow-up to koreader#4815. Pointed out as an easy target [here](koreader#4815 (comment)) by @poire-z. This annoys me too. How do I disable it?